- Christian Göldenboog & Oliver Rüther im wunderbaren Buch ?Die Champagner Macher? : ?Bei Hebrarts Champagner komm stets Freude auf, so als hätte die Horn-Section von Earth, Wind & Fire gerade zum Blasen angesetzt, beim Blanc de Blancs ebenso wie beim Brut Selection, bei dem zwei Drittel blaue Tauben für den Biss sorgen.? Feel free either to take it from me or to contradict me, but ever since, a half dozen years ago, I began experiencing (albeit sporadically) the wines of Jean-Paul Hebrart ? who has run his family?s domaine for 15 years, but whom I haven?t personally met ? it has struck me that the praise generally accorded them is too faint to do justice to Champagnes exhibiting perhaps so much sheer deliciousness that commentators simply overlook their profundity or forget how hard it is to achieve, vintage after vintage, such consistent clarity not to mention excellence. (And most of wines here that aren?t labeled with vintages are still each dominated by a single one). Hebrart?s vines grow in Chouilly, neighboring Oiry, and Mareuil-sur-Ay. Malo-lactic transformation is routine at this address and selected cuvees see small barrel, neither of which practices here preclude wines of utmost transparency to nuance, or ones that ever forget their first duty to refresh." - 92 Punkte WINESPECTATOR (10/2015): "Hints of yellow peach and pineapple ride the bright, lively bead of this firm and focused blanc de blancs, layered with a floral overtone and notes of lemon parfait, candied grapefruit zest, chalk and salted almond. Mouthwatering. Disgorged March 2014. Drink now through 2020." - 92 Punkte VINOUS, Antonio Galloni (11/2014): "The NV Brut Blanc de Blancs is fabulous. Lemon peel, white flowers, crushed rocks and mint jump from the glass. The flavors are classic Chardonnay, but there is a sense of volume here that is hugely appealing. Best of all, the Blanc de Blancs is a superb value. The Blancs de Blancs is a bit unusual, as 70% of the fruit comes from Mareuil, where Pinot is more common, while 30% of the fruit comes from Oiry and Chouilly. This release is 65% 2010 and 35% 2009/2008 juice. This bottle was disgorged in March 2014. Dosage is 8.5 grams per liter. 2014-2020." - 92 Punkte VINOUS, Josh Raynolds (1/2015): "(8.5 g/l dosage; disgorged in March, 2014): Pale yellow. A heady, mineral-dominated bouquet displays scents of fresh citrus and orchard fruits, jasmine, green tea and sea salt. Shows very good clarity and lift on the palate, offering zesty lemon-lime and bitter pear skin flavors sharpened by white pepper. The mineral quality defines the persistent finish, which features a subtle touch of buttered toast." 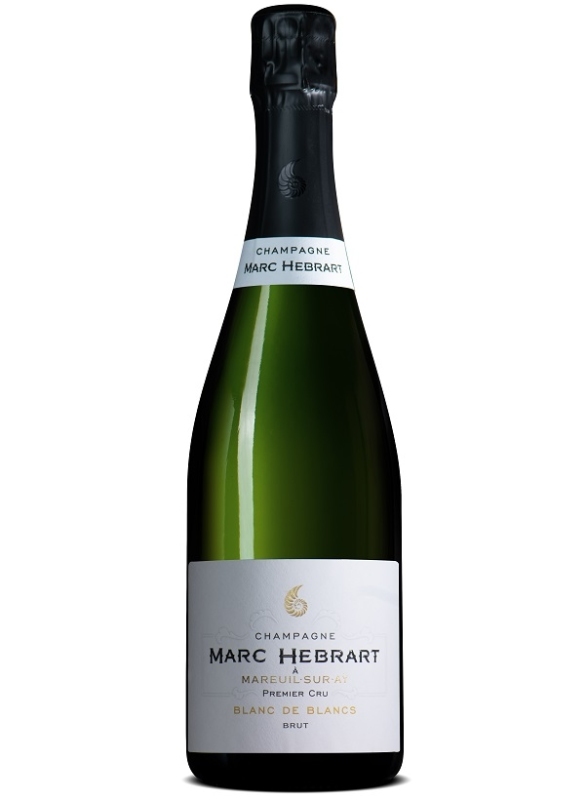 - *(*) Champagner Spezialist PETER LIEM: "This is 85 percent Mareuil-sur-Aÿ and 15 percent Oiry and Chouilly, with 35 percent of the blend made up of reserve wines. It?s flowery and fragrant, with an elegant and elongated structure, and while it shows the body and presence of a Mareuil champagne, the finesse and chalkiness of the Côte des Blancs vineyards are very much in evidence as well. This is an excellent edition of this cuvée, and it?s already showing superbly well. Last tasted: 3/17"
"Hébrart?s wines have a broad appeal: if you like to think about your wines, they?re intellectually engaging enough to satisfy you; on the other hand, if you?re just looking to drink, they?re simply delicious. The wines are full and generous without being weighty, complex and soil-driven without being demanding. Overall, the entire range is of consistently high quality, and Hébrart is quickly becoming one of the finest grower estates in the Grande Vallée. Happily, his wines also represent excellent value for the money, at least for the moment." - 92 Punkte VINOUS, Antonio Galloni (11/2018): "The NV Brut Blanc de Blancs is rich, tropical and racy, all of which give it considerable appeal. One of the most overt wines in this range, the Blanc de Blancs is decidedly open-knit and radiant, with real substance that carries through to the expressive, supple finish. The blend is 70% 2014, 20% 2013 and 10% 2012. Disgorged: December 6, 2017."